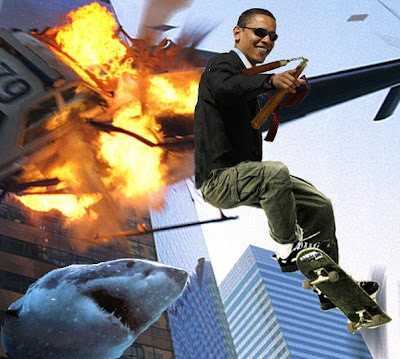 This is what happens when you search Google to see if any websites have written about your shark petition on the White House's We The People website: You find a picture of Barack Obama on a skateboard with nunchaku jumping over a shark while dodging an exploding helicopter. As of now we have about half of the requisite 5,000 signatures. If you haven't yet, please take a moment to sign and share the petition with your friends and family. We have until October 22 to get the remaining signatures, but it would be nice to have it sooner than that. Even though we weren't the first to reach 5,000, perhaps our petition can be the first that gets a response? SHARKMAN Manoa Rasigatale moved an inch close to his dream - thanks to Chinese basketball superstar Yao Ming. The recently-retired NBA giant has joined the worldwide campaign against the shark fin trade, which has pushed the ancient species to the brink of extinction. Yao's decision is a big boost for campaigners such as the Sharkman, who is lobbying for legislation to ban the fishing of sharks in Fiji's waters. Like the move in California to remove shark fin soup off the menu, Yao wants his fellow countrymen to stop eating this top-of-the-range dish. After the fins are sliced off, sharks are discarded back into the ocean. Their speed diminished, maneuverability affected, they sink to the bottom where they are condemned to a slow, agonising death. "Oqo na mate vakaloloma (this is such a pitiful death)," says Rasigatale. "It is so sad that Fijian fishermen who are in this trade have forgotten our special relationship with the sharks. "It is our duty to protect them just as they protect us by safeguarding the reef, which is the life of the sea and us living in the islands. "Our forefathers protected the sharks, it is our duty to do likewise." Shark fins from Fiji are flown to Hong Kong and transported to restaurants across mainland China and Taiwan. Despite growing calls to ban the trade and consumption of shark fin products, demand in China has been growing rapidly as the economy booms. 1.5 million sharks are slaughtered every week to cater for this demand. The PEW Environment Group, in conjunction with the Coral Alliance, appointed Rasigatale to create awareness, help stop the slaughter in Fiji's waters and cut off supply to the Chinese market. Delicacies ù such as shark fin, abalone and rare birds ù are staples for a luxurious banquet in this country. It is common practice in wealthy circles to give money in red envelopes as wedding gifts and the new couples, in return, try to provide a banquet worth the value of the large amount of money they received. They do this by serving expensive cuisine. Some Chinese believe eating such delicacies bring long life. Rasigatale says there is nothing nutritious in shark fin soup, "just cartilage". In Shanghai on Thursday, Yao and British tycoon Richard Branson joined forces to get shark fin off the menu. "Few people know the importance of sharks in maintaining the ecological balance," Yao was quoted as saying by the China Daily at the launch of the campaign. "Nor do they realise the cruelty of the finning process. "There is no reasonable explanation for this cruelty." The Shanghai campaign, sponsored by conservation group WildAid, is the first high-profile-led one in marine conservation in China. Branson told the China Daily shark fin soup was just a tradition in China. "Those who eat shark fin soup told me they don't particularly like it," Branson, president of Virgin Atlantic Airlines, said. "It's possible to get people to switch to other food and make the soup unfashionable." Pacific island journalists who are part of a delegation touring China say the island region must do more to protect the ocean and its resources for their future generations. 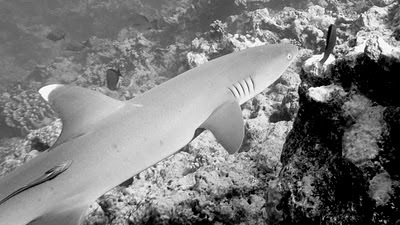 Solomon Islander Johnson Honimae, who now works in Suva, said his people of Malaita have a special bond with the sharks. "We don't eat sharks because they protect us," he said. "There is some work being done to protect the ocean in the Solomons but there is more to be done." Papua New Guinea journalist Peter Pusal said Pacific islanders need to be aware of the dangers they face if the sharks disappeared. "Our children need to understand what they mean to the marine life cycle and we need to make sure there is legislation to ensure the survival of sharks. "We don't eat sharks back home." During this tour of China, he and his colleagues are wary being served shark fin soup when attending banquets. Wu Qi, a white-collar worker in Shanghai, is planning her wedding for later this year. "We booked the 5888 yuan per table banquet and shark fin soup is listed in all three protential menus." Wu and her fianceé convinced their parents to serve sea cucumber, which is also exported to China from Fiji, instead. They said their friends would be concerned about the environmental effect, especially as one of them works for Greenpeace. A survey by the China Daily showed that some restaurants and hotels, such as the URBN Hotel Shanghai, where Yao and Branson launched the campaign, stopped serving shark fin soup. The Dragon Hotel, a five-star hotel in Hangzhou, Zhejiang Province, announced it had stopped serving shark fin dishes from September 19. It said more than 30 shark fin dishes were removed from the menu - at a big cost. Its revenue is expected to drop by six million yuan a year. Jin Ding Xuan, a Cantonese seafood restaurant chain in Beijing, has gone a step further by stopping all sales of live seafood from last October. For Rasigatale, this will mean good news. If the market diminishes, so too will the supply. His mission is to ensure laws are in place in Fiji to ensure shark sanctuaries for his grinny, razor-sharp toothy friends of the deep. He won't be able to easily change the appetite of the hard-to-convince Chinese. But if Yao can make a yard, so too the Sharkman. "My job is to help deny them the shark. And my country must help." UNITED NATIONS -- Mexico announced here plans yesterday to ban shark and stingray fishing starting next year, creating what would be the largest initiative by one nation to protect shark species. Conservationists estimate that about 73 million sharks are slaughtered each year mainly for acquiring their fins, and they fear that the uncontrolled and illegal fishing of sharks will drive 30 percent of shark species to the International Union for Conservation of Nature's classification of threatened or near threatened with extinction. "I think that's a tremendous development," said Matt Rand, director of global shark conservation at the Pew Environment Group. "Mexico is a big fishing nation, it's a very important nation globally, and that's a tremendous statement that was made." There are currently about five national shark sanctuaries. And more are on the way. A representative from the Federated States of Micronesia said his nation would likely announce a new shark sanctuary soon. Palau was the first state to establish a sanctuary when President Johnson Toribiong declared his nation's seas and EEZ off-limits to shark fishing. The Maldives in the Indian Ocean has since followed suit, along with the Marshall Islands. 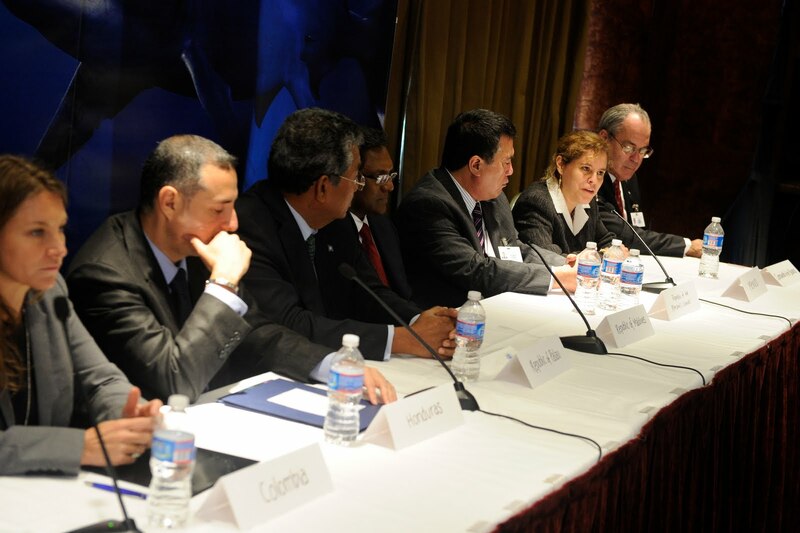 Representatives of Honduras and Colombia were also present when Mexico made its announcement, and those two states say they are pursuing similar initiatives, including a possible protective corridor for sharks stretching from Colombia's Pacific coast to the Galapagos Islands of Ecuador. California recently announced a ban on shark fin sales, Pew's Rand said, and it has being followed by Washington state, Oregon, Hawaii and the U.S. territories of Guam and the Northern Mariana Islands. This is excellent news. Congratulations and thanks you to the governments and people of Mexico, The Bahamas, Palau, Maldives, Honduras, Colombia, Micronesia, and Marshall Islands for pledging and working to protect sharks. It is about time the United States also took a stronger stand for shark protections. Shark Defenders has started a petition on the White House's We The People website asking President Barack Obama to "ban the sale, trade, and possession of shark and shark products, including shark fin." In the first two days nearly 1,000 people have signed the petition. When it reaches 5,000, the Obama Administration will issue a response. Please take a few minutes to sign the petition here. The website is slow and it takes a little bit longer than most petitions sites to sign, but this petition goes directly to the White House and we are guaranteed a response if we meet the threshold of 5,000 signatures by October 22, 2011. Please take a few minutes to sign. El gobierno de México anunció su intención de declarar en 2012 una moratoria a la caza de tiburones y mantarrayas en aguas nacionales, con objeto de proteger la decreciente población de estas especies en el mundo. La embajadora alterna de México ante Naciones Unidas (ONU), Yanerit Morgan, dijo que México pretende proteger a dichas especies mediante una moratoria que entraría en vigor el próximo año. En un evento organizado por la delegación de Palau y de Honduras ante la ONU con objeto de declarar un mayor número de santuarios para el tiburón y las mantarrayas, Morgan explicó que la moratoria tendría validez en el Océano Pacífico, el Mar Caribe y el Golfo de México. La diplomática informó además que el gobierno mexicano promovería de alternativas laborales para la población que depende económicamente de la caza de las especies que se propone proteger. El anuncio de México se sumó al que hicieron Bahamas, Colombia, Maldivas, las islas Marshall y Micronesia para adherirse a los esfuerzos de Honduras y Palau para proteger al tiburón y a las mantarrayas en el mundo. Numerosos estudios han documentado los profundos declives en la población de tiburones, en tanto que la ONU ha estimado que la mitad de las especies altamente migratorias de este pez están sobreexplotadas o al borde de la extinción. Se calcula que hasta 73 millones de tiburones mueren cada año, principalmente para abastecer el mercado de la aleta de esta especie marina. Actualmente, los tiburones gozan de santuarios de 2.7 millones de kilómetros cuadrados, a los que se sumarían seis millones de kilómetros cuadrados de áreas protegidas según los compromisos que se anunciaron. NEW YORK (Sept. 22, 2011)—Leaders from eight countries launched an initiative today to prevent the extinction of sharks, symbolizing the latest development in the growing movement to safeguard the ocean’s top predator. 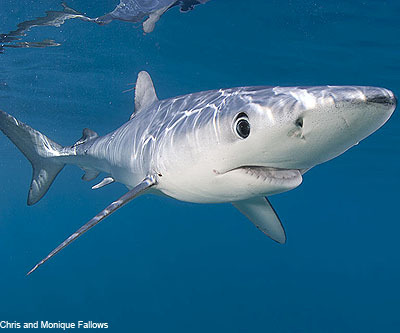 Members of the coalition committed to a declaration supporting the development of sanctuaries that end commercial shark fishing in their national waters. This announcement comes just one year after President Johnson Toribiong of Palau and President Porfirio Lobo Sosa of Honduras issued a global challenge to protect dwindling shark species. Several countries, states and territories have answered that call by committing to a range of conservation policies. This year, Honduras, the Bahamas, the Maldives and Tokelau have created sanctuaries for sharks off their shores, and the countries of Micronesia committed to establishing them in their waters. Commercial fishing of these animals is now prohibited in more than 2.7 million square kilometers (1 million square miles), an area larger than Mexico and Texas combined. Domestically, trade bans on sharks and shark products recently passed in California, Washington and Oregon, and internationally in Guam and the Northern Mariana Islands. 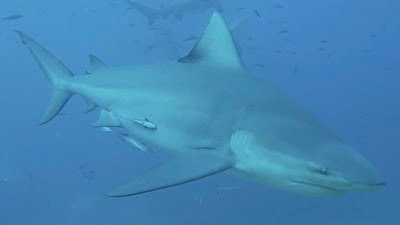 “With each new sanctuary, sharks gain another ally in their fight for survival,” said Matt Rand, director of Global Shark Conservation for the Pew Environment Group, the organization which is spearheading efforts to establish shark sanctuaries where targeted fishing for the species is prohibited. Sharks are especially vulnerable to overfishing because they mature and reproduce slowly. As top predators, their depletion also has risks for the health of entire ocean ecosystems. Up to 73 million of these animals are killed each year to support the global fin trade, while 30 percent of all sharks are threatened or near threatened with extinction. Some populations, such as the scalloped hammerhead, have declined by up to 98 percent. But many governments are recognizing that sharks are more valuable alive and can be a key economic driver as a tourist attraction. Sharks are the intended catch of some fisheries. They are also frequently caught unintentionally as bycatch. In certain fishing operations, including open sea longliners that target tuna and swordfish, as much as 25 percent of the take can be shark bycatch. • advocate for better science-based precautionary protection for sharks in all international fora. 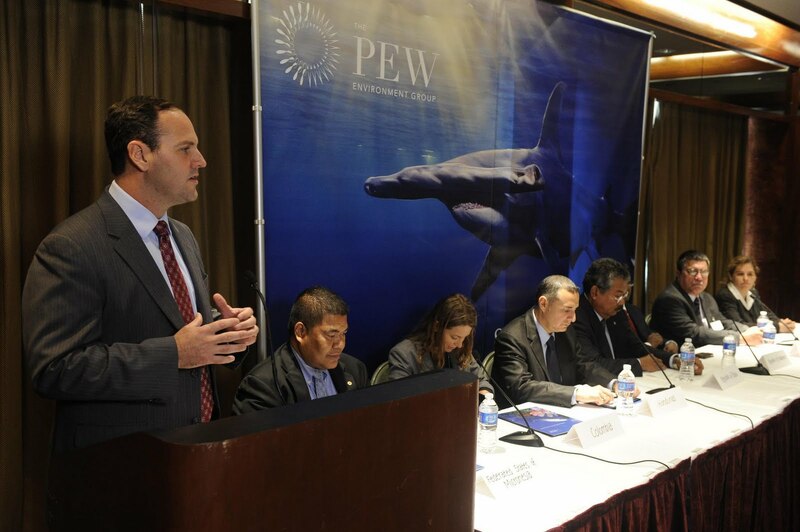 “We applaud these countries for their leadership in protecting these amazing animals, and Pew will continue to work with governments and key stakeholders to support shark conservation efforts as they implement these new commitments,” said Rand. Shark Defenders created a new petition on We the People, a new feature on WhiteHouse.gov, and we are asking for your support. Will you add your name? If this petition gets 5,000 signatures by October 22, 2011, the White House will review it and respond! Also, will you repost the petition to Facebook and Twitter? The Obama Administration should ban the sale, trade, and possession of shark and shark products, including shark fin. agreements and signed the Shark Conservation Act, but this only mandates how a shark is killed, not how many. On average, the USA lands 30,000 tons of shark per year. Palau, Maldives, Honduras, Bahamas, and Tokelau have declared national shark sanctuaries, banning the commercial fishing of sharks in their waters and ending the shark trade. Domestically, laws have been passed banning the sale, trade, and possession of shark in Hawaii, Washington, Oregon, California, and the territories of Guam and Northern Marianas. The USA should implement a national shark and shark fin ban. 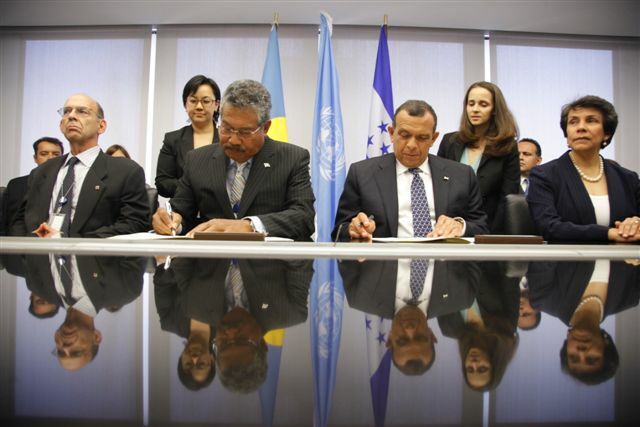 President Toribiong and President Lobo Sosa at the United Nations in September 2010. The president of Palau and the president of Honduras tomorrow are to announce the launch of a global shark conservation coalition. Johnson Toribiong, president of Palau, and Porfirio Lobo Sosa, president of Honduras, are to be joined by leaders from other countries to sign a new declaration committing to the development of sanctuaries, which end commercial shark fishing in their national waters, the release states. The signing is to take place at the Millennium UN Plaza Hotel in New York City, the release states. Matt Rand, director of global shark conservation of the Pew Environment Group, is also to be at the signing. The Pew Environment Group is the conservation arm of The Pew Charitable Trusts, which is a non-governmental organization that works globally to establish pragmatic, science-based policies that protect the world’s oceans, preserve wildlands and promote clean energy, the release states. Two years ago, no country had declared all of its waters as a sanctuary for these creatures. Today, more than 2.7 million square kilometers have been set aside, more than the area of Mexico and Texas combined, according to the release. 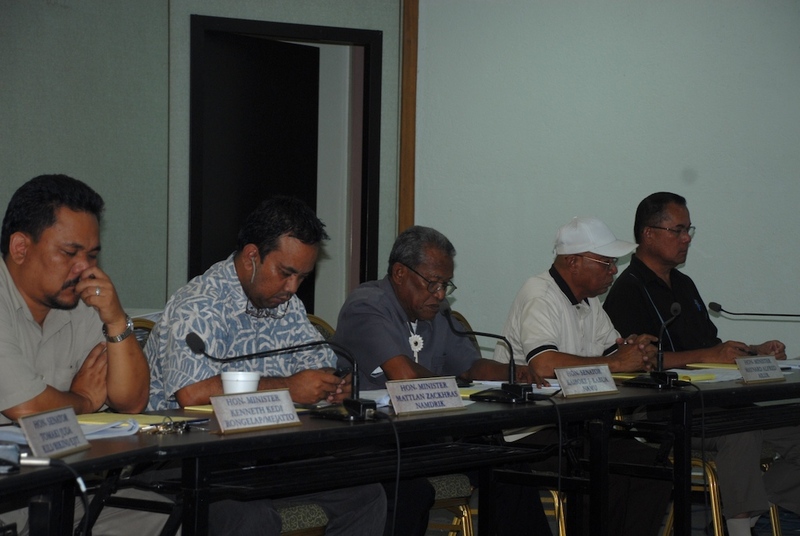 Members of the Committee on Resource and Development hear testimony on the Marshall Islands proposed shark protection law. Photo: Stefanie Brendl. A bill to ban shark finning in the Marshall Islands was backed by a Hawaii state senator and many local testifiers at a parliament hearing Wednesday. Hawaii state Sen. Clayton Hee, who flew out to testify in support of the proposed legislation, joined with Marshall Islands leaders saying it is time to halt the killing of sharks that is undermining the marine ecology system. Introduced by six members of parliament, the new bill wants to halt the possession, sale or transshipment of any shark part with fines for violations ranging from $5,000 to $250,000 and jail terms of up to a year. Bill introducer Sen. Tony deBrum said the bill is patterned closely on laws already approved by many islands in the region, including Hawaii, Guam, the Northern Marianas, and elsewhere, including U.S. states. Members of the Majuro community pack the public hearing room to provide testimony. Photo: Stefanie Brendl. Marshall Islands Marine Resources Authority Director Glen Joseph testified in support of the bill. Joseph’s agency has its own shark ban planned as part of a larger fisheries law revamp that is to be introduced to the parliament later this month. But he said he supported this stand-alone shark ban bill. People testifying at the hearing said longline fishing boats catch large volumes of shark for their fins that is labeled “bycatch.” Hee said this can be stopped by restricting the type of fishing gear and hooks the longliners are allowed to use. 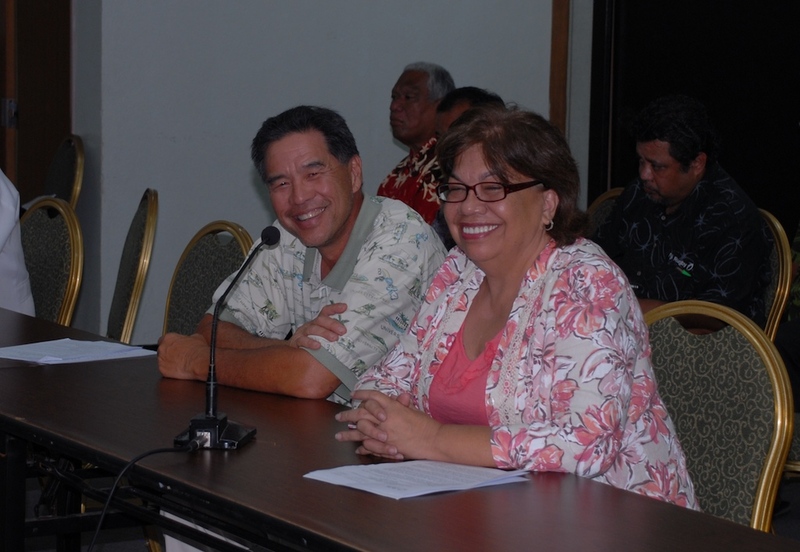 State Senator Clayton Hee of Hawaii (left) and State Senator Carlotta Leon Guerrero of Guam (right) testify on behalf of shark protections. The pair have advocated for shark protections across the Western and Central Pacific in recent years. Photo: Stefanie Brendl. Hee said Hawaii “provides the perfect example of what happens in the marine ecology system when fish are depleted through greed. In Hawaii, by inattention to a sustainable lifestyle” many fish species were wiped out and reefs died, Hee said. Shark fishing is not a Pacific island legacy, Hee said. It’s an industry driven by an Asian market for people who are wealthy to indulge in eating shark fin-related products, he said. The parliament committee is expected to issue its report on the shark ban bill to the parliament when it reconvenes next week. Published in the Marianas Variety and Marshall Islands Journal on Friday, September 9, 2011. (T)he Florida Fish and Wildlife Conservation Commission board on Thursday will hear staff proposals on protecting sharks. Tiger sharks and three species of hammerhead sharks (great, smooth and scalloped) all should be added to Florida's no-take list, which now includes 22 shark species, says the recommended action. Tiger shark "research in the Florida Keys indicates there may have been a significant decline in their numbers there, where they were once considered abundant," an agency report notes. National studies suggest tiger shark populations have dropped significantly, by up to 97 percent in some locations. The Asian appetite for shark-fin soup has led to increased mortality on big sharks, which are slow to reach sexual maturity and do not breed in large numbers. As a result, shark populations "can take decades to recover once they become depleted," scientists reported. A series of seven statewide workshops on sharks, including one in Key West, found widespread support for adding the four shark species to the protected list, staff said. Two other shark proposals -- to require use of circle hooks in shark fishing, and to ban chumming from shore -- did not get endorsed by FWC staff. It has been a busy week for shark conservation, with California, Tokelau and now Florida moving protections. Thank you for your continued support in all these initiatives. This is Rob Stewart, I just heard that the opposition is going to be out in full force at Toronto City Hall this week where the motion to ban shark fin is on the agenda. AB 376 is enacted and takes effect on or before January 1, 2012.
submitted in compliance with Section 9795 of the Government Code. AB 376 Passes California Senate 25-9! On to the Governor's Desk! The bill heads to the desk of California Governor Jerry Brown for signature. 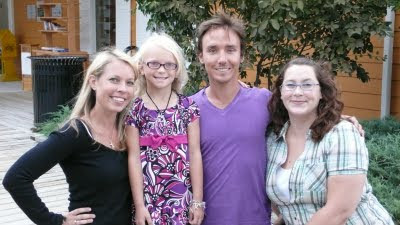 Port Carling, Canada's 7-year old Kassidy with Rob Stewart, director and producer of Sharkwater. When 7-year-old Kassidy heard that between 26 and 73 million sharks a year were being killed just for their fins, she jumped into action. For this 1st grade student from Port Carling, Canada asking her family and friends to sign the petition to save sharks simply wasn’t enough. In three short days she gave a presentation in every classroom at Algonquin Ridge Elementary in Barrie, collecting over 600 signatures to support shark fin ban legislation in Toronto. To thank her personally, Stewart invited Kassidy to the recent “Making Waves for Wildlife” fundraising event for the Muskoka Wildlife Centre where Stewart gave a keynote address about species and ecosystem conservation. United Conservationists' Julie Anderson, Rob Stewart and Zennifer Zabawa with Kassidy. “I feel that this experience has profoundly affected Kassidy.” Said Kassidy’s mom, Suzanne, “I was so surprised to see her tongue tied - that is a very rare occasion.” Kassidy, who aspires to become a veterinarian, learned that even though she is young, she can make a difference. And, Kassidy’s efforts continue to grow; the Muskoka Wildlife Centre has placed her petition at their facility and is collecting even more signatures. Stewart continues his mission to save sharks worldwide, hosting a fundraising event in his hometown of Toronto to help support the Fin Free Toronto campaign launched by his non-profit organization, United Conservationists on September 14th. Read Rob Stewart's guest blog, Kids Can Protect the Ocean, Too to see how kids are leading the charge to protect the world's sharks.